Barrington Stage Company, which in recent years, has given us spot-on revivals of Company, Man of La Mancha, Ragtime, and On The Town, opens its mainstage season with the world premiere of The Royal Family of Broadway, a musicalization of George S. Kaufman’s and Edna Ferber’s 1927 comedy, The Royal Family. Barrington Stage developed the musical in their musical theatre lab. Rachel Sheinkin and William Finn, who wrote Barrington Stage’s The 25th Annual Putnam County Spelling Bee, which moved to Broadway, and John Rando and Joshua Bergasse, who staged and choreographed On The Town, which moved to Broadway, are helming this production. The creators are working with sublime material, the story of a theatre dynasty, likely patterned after The Barrymores. 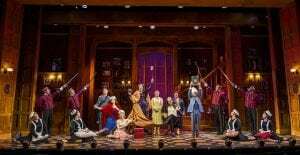 The original production of The Royal Family was a big hit, as were its 1976 Broadway revival, which was telecast on PBS the following year. The play was adapted in 1930 by Herman Mankiewicz for the film The Royal Family of Broadway released by Paramount Pictures. The film was directed by George Cukor and Cyril Gardner. 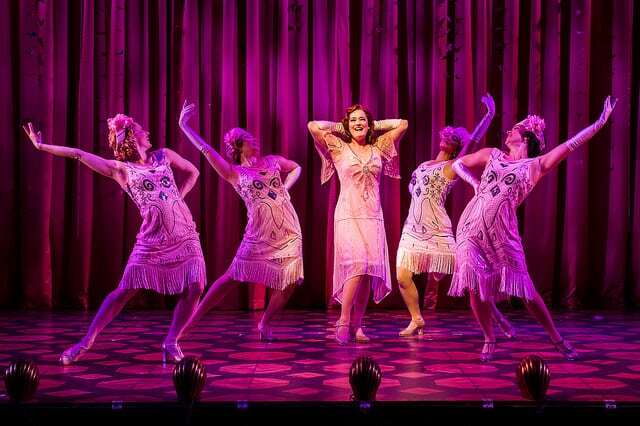 Laura Michelle Kelly and company in The Royal Family of Broadway. Photo by Daniel Rader. The Cavendish Family, onstage, backstage, and at home, are melodramatic, attention-craving larger-than-life “artists of the theatre”. Matriarch Fanny, deliciously played by Harriet Harris, keeps her brood in the footlights, although daughter Julie, played by Laura Michelle Kelly, wants to marry a suitor she’d been in love with decades prior. Her daughter, Gwen, played by Hayley Podschun, doesn’t want the theatre life at all, and son Tony, a swashbuckling Will Swenson, returns from Hollywood to follow his spirituality, but craves the spotlight and the applause. Sheinkin has written a book that emphasizes the many characters’ over-the-top poses, gestures, and grandeur. William Finn’s score evokes the Broadway of the Charleston era, with some more contemporary power ballads, and a laugh-out-loud second act opening scene of an hilariously “bad” Viking musical. John Rando’s staging is spot-on, and Joshua Bergasse’s choreography, particularly the showstopping opening number, “Listen to the Beat”, and a lovely pas de deux, “Baby, Let’s Stroll” got sustained applause. Alexander Dodge, who designed Hartford Stage’s Anastasia, creates a glamourous world of 1927, enhanced by Alejo Vietti’s gorgeous costumes. Jeff Creiter’s lighting, Joshua D. Reid’s sound design, and Mary Schilling-Martin’s wigs are fabulous. Vadim Feichtner’s music direction and Bruce Coughlin’s orchestrations really enhance Finn’s score. The entire cast is terrific. Will Swenson, last seen at Barrington Stage as The Pirate King in The Pirates of Penzance, sizzles as the actor who knows he sizzles. Laura Michelle Kelly, who recently played The Bushnell in The King and I, knocks some power ballads from stage to rafters. 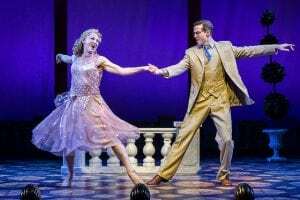 Hayley Podschun from Goodspeed’s pre-Broadway Holiday Inn, is a terrific dancer in her duets with A.J. Shively. Harriet Harris, from Broadway’s Thoroughly Modern Millie and Berkshire Theatre Group’s Arsenic and Old Lace, and upcoming Sister Mary Ignatius, stops the show with her rendering o “Stupid Things I Won’t Do”. The Royal Family of Broadway is not Broadway-ready yet. It needs some pruning, some more choreography, and perhaps one or two less songs. But, it’s light, fun entertainment, beautifully produced and performed, and ought to make a lot of theatergoers happy. Kudos to Barrington Stage for developing and nurturing new musicals.